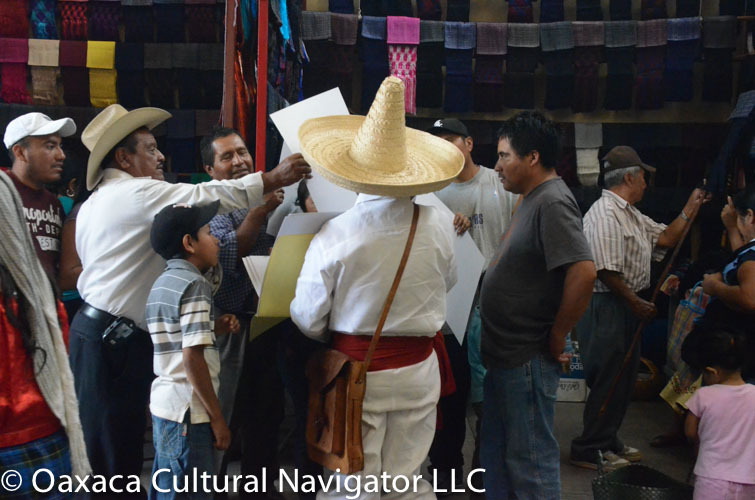 Every Sunday, with the exception of Easter, all the Teotitlan del Valle buses and collectivos go back and forth from the village to the tianguis at Tlacolula de Matamoros. If you want to get from Oaxaca City to Teotitlan on a Sunday, that’s a different story (see below). 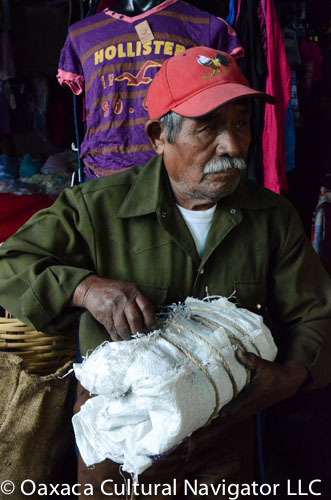 The regional street market draws thousands of sellers and shoppers from throughout the Valles Centrales de Oaxaca. It is a confusion of blue and green tarps that cover probably ten square blocks of the town center, a protection from sun and rain. It is also a cacophony of stuff: farm tools, meats, vegetables, household staples, garden plants and tourist treasures. I’ve been to this market enough times to recognize the regulars. 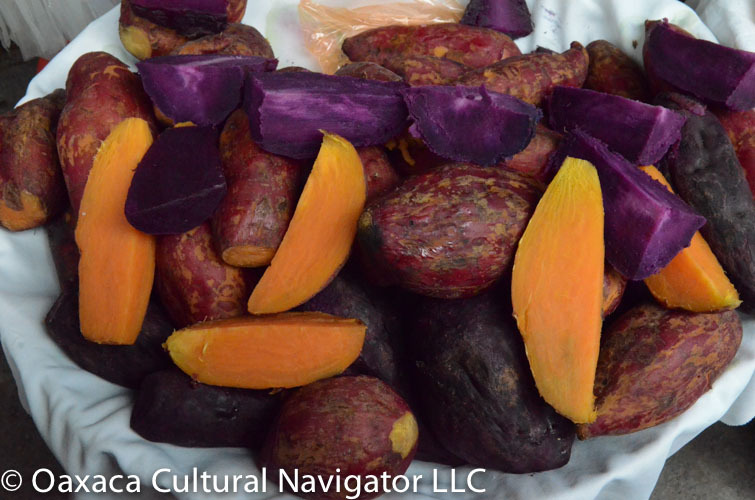 Among my favorites are the sellers of brightly colored plastic woven baskets, embroidered aprons, and dried hibiscus flowers that I use to make agua de jamaica (ha-my-kah). Vendors haul their goods wrapped in the plastic tarps they will use to cover their stalls. Most will use the public vehicles provided by their villages, all pointed to Tlacolula on Sunday. It is wonderful to catch the bus at the corner of my street and join the pack. At 11 a.m. it’s hard to find a seat unless you get on at the village market origination point. 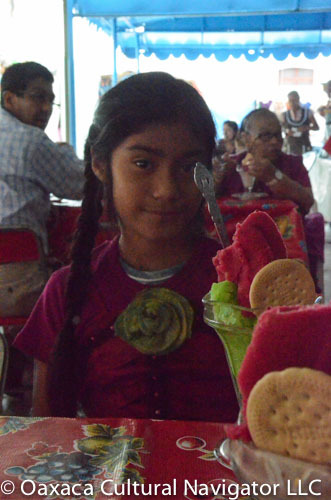 Today, my traveling companion is my eight-year-old niece Ixcel Guadalupe, who we call Lupita. She is wearing her best Sunday-go-to-church-dress, adorned with the green felt flower we made together the day before. Today, my shopping list is a pretty mundane: a bell for the front gate, a rope to hang it, a tightly woven bamboo basket with tray lid to adapt as a packing container for the gifts of mezcal bottles. I’m always open to whatever else may present itself. I have in mind to get Lupe a smaller version of my shopping basket and perhaps a new apron. First, we come across a costumed Pancho Villa selling art posters of the revolutionary army. We look and move on. Leopoldo Barranco, Calle Galiana #3, San Bartolo de Coyotepec. No phone. Leopoldo is home all day during the week, he says. A lovely man, definitely worth supporting this ancient craft. His pots are much more interesting, in my opinion, than the commercially produced pieces one sees all over town. 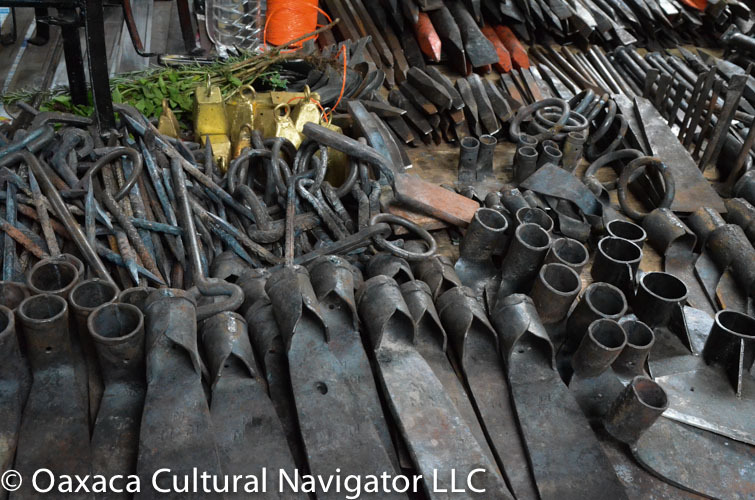 These tools (above) are all hand-forged. The picks are incredibly sharp. I bought two of the golden bells, and two stakes with rings that I am using to secure my roof-top laundry line. By this time, I’m hauling the clay pot, the basket, the metal stakes, and bells. She is carrying two aprons in her little basket. 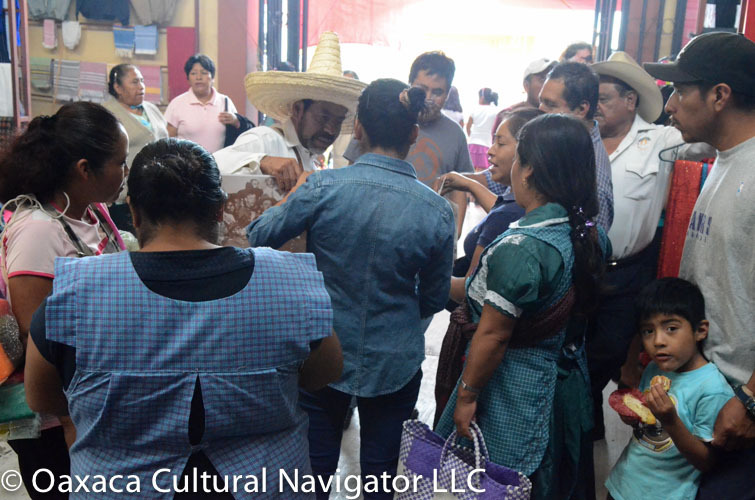 I decide it’s easier and faster to take the Teotitlan collectivo back to the village. The collectivo station is behind the Tlacolula Zocalo. Turn right, then left. Or ask anyone! 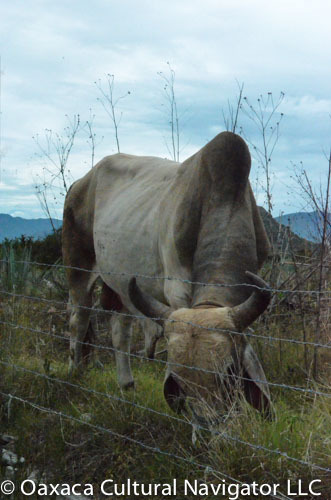 When we get home at 4 p.m., we are greeted by a herd of grazing toros in the field next door. Now, it’s time to pack those bottles of mezcal! Getting to Tlacolula from Teotitlan del Valle by bus: All the village buses go to Tlacolula on Sundays. They run about every 30 minutes starting early in the morning. Catch it either at the mercado or anywhere along Av. Benito Juarez. Cost is 7 pesos (under 10 cents) each way. Last bus leaving Tlacolula for Teotitlan is at 5 p.m. The collectivos leave from the parking lot on Benito Juarez. They go when they are filled with five people — two in front (plus driver) and three in the back. Take the back seat if you get the chance. Much more comfortable. Cost is 5 pesos one way per person. Getting to Teotitlan from Oaxaca on a Sunday: You can take a private taxi that will bring you right into town to your particular destination for 250 pesos. For 10 pesos, catch a bus at the baseball stadium headed toward Tlacolula or Mitla. Ask to get off at the Teotitlan crucero (crossroads). Take a collectivo, or bus or moto-taxi from the crossroads into town. Don’t pay more than 10 pesos for the moto! The bus will cost 7 pesos and the collectivo 5 pesos. 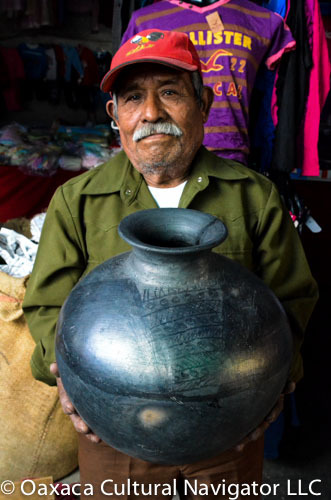 This entry was posted in Cultural Commentary, Pottery and tagged black clay, bus, collectivo, market, Oaxaca, pottery, shopping, Sunday, Teotitlan del Valle, Tlacolula, transportation. Bookmark the permalink. Hi! So happy to stumble across this resource. We are planning on being in Oaxaca in February. I want to bring back some textiles and possibly clothing. 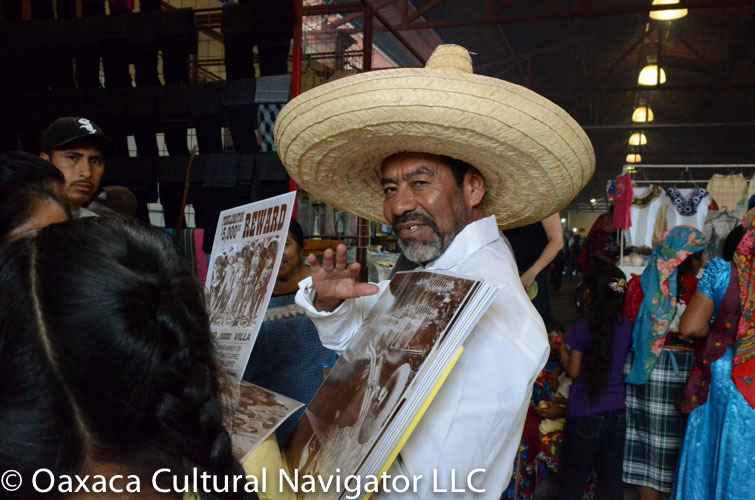 Is the Sunday Tlacolula Market a good source for that? I am hoping to visit Tlacolula to photograph the street art and murals. Also, what is the best way to get the items back to the states? This is my first adventure in buying outside the states. Thanks for any information you might have. Blown away and getting so excited. I definitely would be interested in a textile tour–exactly what I was hoping for!…Will contact you closer to our arrival. Thank you! Thanks for this informative posting. 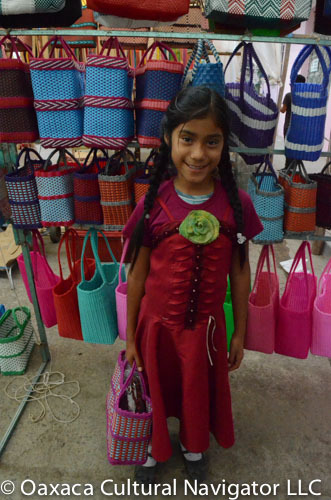 We took the bus fron Oaxaca ,no problem.What a wonderful market in the heart of Mexico. Took your ad vice ,had lunch at Comedor Alice,delicious. Easy trip back .Love the bus ride too. Thanks, Holly. Glad you enjoyed it and the information was helpful. Does customs permit one to carry mescal bottles, mole, freshly ground chocolate or quesillo to the USA? I so enjoy your news letter. Going to San Miguel de Allende in February. Do you keep the inverted top on your bamboo basket with your duct tape? I ALWAYS have taken bubble paper (you can buy big rolls at Walmart) and masking tape – have found one needs scizzors for the clear tape but the masking tape comes off more easily. Have fun in Morrocco…..
Hi, Sue, thanks for the tip about packing scissors if one prefers the clear tape. I think the gray duct tape holds better. Yes, I wrap the duct tape completely around the basket and top several times. Have fun in SMA. It is a magical colonial city, too. Es la mama de Lupe, Ernestina? I love that there is a bell on your gate and a clothes line on your roof and that I’ve been there!!! Thanks for the link, Globavore!